Clarinet black color Aspire E1-510-2601 notebook is one of Acer's 2014 model Intel Celeron quad core budget computers with solid performance, that looks nice, is functional and suitable for daily activities like surfing the net, chatting live with people, play music, videos and light games. Don't expect a super powerful advanced machine but still is good value for money- one of the best you can have as an entry level PC. Acer Aspire has an Intel Celeron N2920 quad core processor at speeds between 1.86 GHz and 2.0 GHz with Intel Burst, 4 GB DDR3L SDRAM that can go up to a maximum of 8 GB, 500 GB SATA at 5400 rpm hard drive and the 64-bit version of Windows 8. The processor is sufficient for everyday tasks and some light games, it seems to offer better value for money in terms of efficiency/cost as compared to i3 although not as powerful. Both the 4GB memory and the 500 GB hard drive are standard size for a budget to medium level computer. Many customers still prefer the older Windows 7 over the Windows 8, but in our experience the new Windows 8.1 comes with better features than the Win 8 that you could make use of on a daily basis. 15.6 inch LED backlit HD widescreen CineCrystal Active Matrix TFT Color LCD with 1366x768 pixel resolution and Intel HD graphics 4000 offers one of the best possible image quality you can get at this price range. It is nothing spectacular but more than adequate for well under $300. Sound is also satisfactory through its built-in speakers and contributes to your enjoyment of music, games and movies. 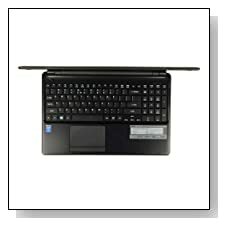 Acer Aspire E1 weighs 5.18 lbs and is between 0,48 to 1 inch thick. The 4-cell 2500 mAh lithium ion battery lasts about 4-5 hours without needing to recharge. Keyboard is comfortable enough even though a bit low and you still hear the clicks on keys and get good response from them. There is no optical DVD drive but a Digital Media Card Reader supporting Secure Digital format, 802.11b/g/n WiFi, Bluetooth 4.0, 10/100/1000 Gigabit Ethernet with RJ-45, an HDMI port, a VGA port, 1 x USB 2.0 ports, 1 x USB 3.0 ports and a webcam with built-in microphone. 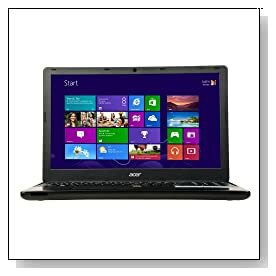 Conclusion: If you're new to laptop PCs and looking for something slim and light to use for internet browsing, word processing and other light to moderate computing tasks, the Acer Aspire E1-510-2602 presents good value overall with a quad core Celeron processor, decent amounts of hard drive and memory with the potential to upgrade, already pre-installed newest Windows 8.1- which is also the primary con pointed out by customers that don't like the new Windows 8 OS, a good variety of connectivity ports including Bluetooth and a USB 3.0 port but no DVD drive (if you ever use one?). This is not a full-on gaming laptop and you couldn't expect it to be at the low price it is offered.